What is so great about a handheld clothes steamer? Well, you can use it to get the creases out of clothes when they're still hanging up! Models with vertical steam are great for curtains, tablecloths. bed linen, upholstery and much more besides. Their small size mean they're ideal for traveling or when you need a shirt or blouse done quickly. Here are the 5 best portable garment steamers available in 2019. Steamers are convenient to have around the home and when you travel. If you need a shirt or blouse in a hurry (and don’t have time to get the ironing board out) one of these is the answer. Portable garment steamers are a godsend when you're working away from home. You can always look great and be stuck wearing something that looks like a road map. ​These are appliances designed primarily for travel use, but also can be useful for home use in emergencies or for last minute touch-ups. ​Features do differ between the various models and price points, so it's important to consider this in relation to your needs. Size – you want a handheld device that is both small and light so you can slip it into your luggage almost unnoticed. All of these are small, but a couple are somewhat heavier than the others so check carefully. Power – this determines how powerful your steam spray will be and how quickly it will heat up. You can get some powerful handheld steamers and they'll save you a lot of time. Speed - When using these appliances it's likely you're in a rush so you don't want to wait around too long for it to be ready. Capacity – as these are portable devices you can only expect to get ​around 8 - 10 minutes out of them. ​All things being equal, bigger is better as you won't have to keep stopping for a refill. Ease of Use – ​you don't want to consider an instruction book when you're in a rush and you want something that is comfortable to use, too. When considering the best handheld steamers of 2019, we kept in mind all the key features we outlined above. We also tried to choose products to fit a variety of budgets and needs. Hopefully, you'll find the best one for you on this list! ​Searching for a ​quick garment steamer that's small and compact enough to slip into a suitcase? Well, the PurSteam Elite ​is a great choice. ​​It has a neat design, with a simple jug-like style including a handle to hold it by and a nozzle that emits ​steam via a series of holes. The water capacity is 106 ml / 3.6 Fl Oz, which is enough for 10 minutes of constant steam. It only takes 80 seconds to start producing steam so you're good to go very quickly. ​At around 700g it weights much less than the average travel iron. ​The relatively small reservoir means it's only good for one or two items. That's fine if you're just steaming the clothes you're going to wear, or don't mind doing a re-fill. ​Linen is where the Pursteam Elite really shines. It makes a great steamer for curtains and other items that are hard to​ iron. ​Like other comparable products, there is a bit of a knack to it. You need to move the steamer in an up and down direction and pull the garment as you steam it. A few users report this is fiddly at first but by the second try it's much easier! ​​This model from Aicok is designed also for traveling and comes with its own travel pouch. ​​​At just 700g and measuring just 21 x 11x 23cm, it's light and easy to fit into an overnight bag. It's got a capacity of 200ml (bigger than the Pursteam Elite) and can keep steaming for 8 - 10 minutes. It’s easy to use, too, with clear and simple controls, and is designed to be comfortable to hold and use. ​​The tank is very easy to fill – a major bonus with these when in tight spaces such as a caravan, for instance – and you get full temperature and steam ​in just over a minute. There are a couple of nifty extras which add to the appeal of this Aicock steamer. The first is it comes with a "Wrinkle Buster" - that's not a face-cream but a small brush which will help with curtains, tablecloths and upholstery. The second is it has an auto shut-off for when it either gets too hot or the water runs out. Personally, I think this should come as standard but a lot of other small steamers don't have this function. ​You can see right away the Jolu Joy steamer breaks away from the typical design - and there's quite a few more differences, too. ​​​​At 1500w, this one is has ​double the power of others on this list which tend to only be around 700w - 850w. The great thing is for the extra power it is still reasonably light and compact, measuring 35cm x 22cm x12cm and weighing just under 1kg. This makes it small enough for travel, and their is a travel bag included. The extra-power really makes a difference when it comes to steam production. The Joly joy is good to go in just 15 seconds, and despite only having a 90 ml tank it produces 4 - 6 minutes of constant steam. A big plus for us it it moves away from the "Kettle" design to a "Shower head" design. This means you can use it to steam both vertically and horizontally. This is a big bonus as you can steam things hanging over chairs and the Kettle kind have a tendency to leak when not upright. As you can see, the Joly Joy comes with not one detachment but four. There's a couple for ironing garments, one for upholstery and cushions and one for sterilising​, too. There's even a measuring jug to reduce spillages when filling up the tank, which is a thoughtful addition. The only thing I don't like about this one is the miserly 12-months guarantee. However, there is a 60-day "No quibble" money back guarante and these appliances are much cheaper than regular-sized garment steamers. 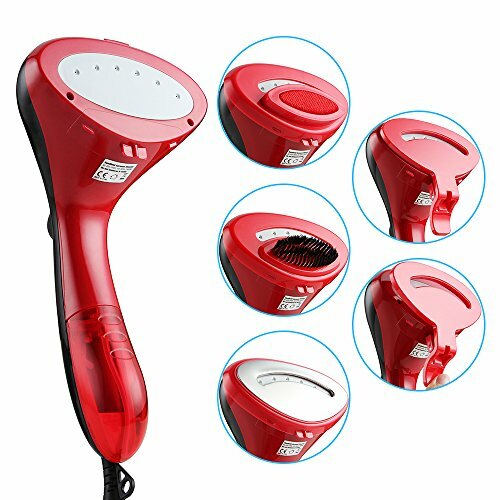 ​​​This is one of the cheapest garment steamers list and it's the smallest, too. ​​​​Measuring 15cm x 8cm x 21cm and ​weighing just over 600g​, you can pop this one in a travel bag and still have lots of room. Despite its small size, the capacity of this steamer is pretty respectable. It can hold 130ml of water which is good for 8 minutes of continuous steam. ​​​We've saved the most well-know brand until last. The Tefal Access at 1500w is a ​portable steamer that's really powerful. ​​​​Th.s steamer puts out 22g / minute of steam and has ​a 200ml water tank. That's almost double the size of other travel steamers, and lets it keep steaming for 10-minutes. There is a trigger (with lock) which allows you to ​have steam "On Demand" - and make it last longer. You can expect this portable steamer to steam a cotton shirt in around 1 - 3 minutes, and a cotton pair or trousers (i.e not jeans!) in around 3 minutes. So in ten minutes you can get quite a few items of clothing done. ​Unlike many of it's competitors, the Tefal Access' water tank is removable. This is a big plus as it prevents you spilling water on the unit itself and makes it easy to clean (essential if you live in a hard water area). ​There is a fabric brush included and a door ​hook for you to hang clothing and steam whilst it's flat. This might not be essential whilst at home, but will come in dead handy when you are traveling. Sadly the one drawback (and it is a big one) with this particular model is it's size! The Tefal Access measures 33cm x 14cm x 21 cm so it's compact but it weighs just under 2kg! That's around three times more than others on our list. Not only can this make it tiring to work the steamer, but it you're flying without check-in, it takes up a lot of hand-carry weight. It's a shame as this is a powerful, well-designed travel steamer from a renowned brand. If you can handle the weight it might still be for you. ​Of the 5 models we have highlighted, we like the Joly Joy handheld steamer the best. ​It's powerful and the design lets you steam things (like curtains and upholstery) vertically without spilling any water. That's something the other kettle-type designs don't let you do. And it's small and compact enough to make the perfect travel companion. Ultra fast heat up & Powerful - 1500 watt ultra-fast heating element, less than 15 seconds heat-up and up to 6-8 minutes of continuous steam, to penetrate heavier fabrics and remove stubborn wrinkles easily. Safe for all fabrics & Kills bacteria - With this portable fabric steamer, you needn't worry about the wrinkles on all kinds of fabrics, safe to be used on all delicate fabrics and it will effectively kill bacteria and viruses present on the material. Handheld Portable & Compact - 90ml detachable water tank, compact size makes it easy to store and perfect for travel or home; We provide you a travel bag in package, very convenient to carry into your suitcase.